Street Fighter V’s newest character, Abigail, is the game’s largest fighter to date, towering over even resident grappler Zangief. Since the character’s arrived on Tuesday, the focus of community discussion has been on his capacity to inflict serious damage with just a few hits. Many players have been surprised by the utility of Abigail’s moveset, while others have set about learning as much as they can about the giant in preparation for the day he’s used in competition. Just how big is Abigail? Big enough to block important meters like the stun gauge during gameplay, and that’s before he activates his V-Trigger, which bolsters his attacks and makes him even larger than he starts out. As a former enforcer for the infamous Mad Gear Gang, Abigail can take care of himself, no matter how silly he acts otherwise. Mixing typical brawling, grabs, and some impressive acrobatics, this giant is capable of outputting ridiculous damage and stun numbers. 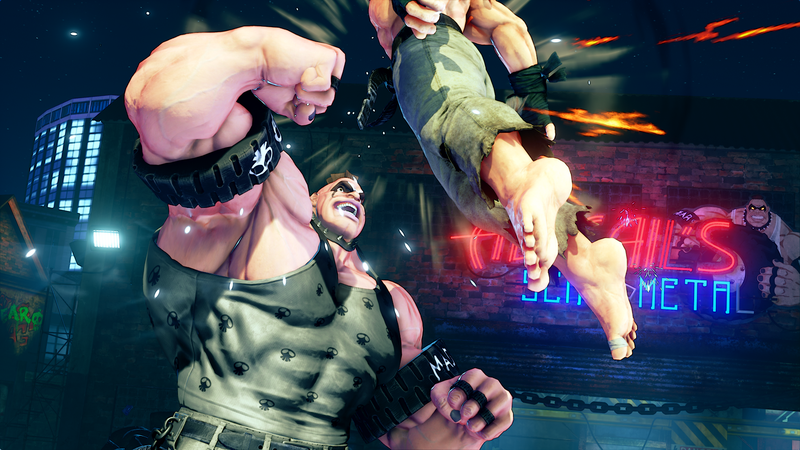 If players are able to guess right or simply trick opponents into eating one of his special throws, Abigail can make that health bar disappear in short order. Not only that, but Abigail can also turn some confusing situations into net benefits. Thanks to moves like his quick EX flip, rolling sweep, and super, Abigail can fight his way out of Kolin and Laura’s smothering pressure, even if the latter hits him in the process. It wouldn’t be a stretch to assume Abigail is pretty straight-forward due to his size. I mean, really, what more does he need to do than smack people around? However, the below video from Rikk shows that he can be pretty sneaky by mixing up his jumping attacks after knocking down the opponent. A jumping medium kick will cross-up the opponent as normal, while a jumping medium punch acts a fake-out, making every wakeup situation a nightmare. As is often the case, combo master Desk has released a handful of videos showing what Abigail is capable of, even if much of what he discovered won’t be used in real matches due to their strict execution requirements and general impracticality. Abigail is also in possession of a swatting move that can reflect projectiles. This even extends to things like Dhalsim’s super and Rashid’s tornado V-Trigger. If you want to learn how to play Abigail competently, look no further than AutoMattock’s detailed basics tutorial. This covers fundamental skills like zoning, blockstrings, what to do on knockdown, and anti-airs, so check it out to gain a deeper understanding of what a smart Abigail should be doing in competitive play. Or, if you get bored of playing seriously, you can just slam the ground repeatedly. Someone is sure to lose to that eventually. And finally, a variety of top players have tried their hands at Abigail, either in preparation for competition or simply to understand what they’ll be up against next time someone chooses him against them in tournament. Evo 2017 champion Hajime “Tokido” Taniguchi, Daigo Umehara, and Chung-gon “Poongko” Lee took Abigail online with varying degrees of success, so check out the replays below for a sense of how veteran competitors learn a new character. As of now, opinions of Abigail are mixed. Players are still coming to grips with the huge damage he can output, even if his general mobility makes getting in on characters a chore at times. Grapplers always seem overpowered at first due to their ability to dish out a ton of pain in short order, but it’s likely we’ll see reactions to this Street Fighter V newcomer balance as time goes on. Have you had a chance to mess around with Abigail? Let us know what you think in the comments!